Viewability is a relatively new term in the online advertising lexicon and it has rapidly becoming a significant factor that determines whether publishers, already under significant pressure to monetize their digital properties, will be able to remain afloat and viable or whether they will lose even more revenue and shut down. Understanding viewability and its impact on a publisher’s ability to earn revenue is critical in the online publishing environment. Ad blocking has seriously eroded the number of users who may see ads and publishers are under increasing pressure from the resulting drop in ad revenues to optimize existing monetization choices and find new revenue sources. As a publisher, you have no choice but to ensure you understand and tackle the growing viewability challenge. Once you do, you will come to the inevitable conclusion that while industry standards for measuring viewability are still being developed, it will become a critical metric for ad performance that links directly to your ad revenue. Making better decisions about ad placement and ad product choices are an effective monetization optimization strategy. What is viewability and what are the challenges? According to Digiday, the challenge facing the industry is that “up to 54 percent of ads aren’t viewable”. This means that while advertisers have been paying for impressions or page views, roughly half of what they are paying for is hypothetical. Not all of those impressions or page views translate into human beings physically seeing ads and having an opportunity to engage with them. Along with its corrupting effects, the page view itself has been corrupted. It’s easy to fake (see the gallery above). Advertisers get that counting each click on an endless slideshow as a page view doesn’t equal a multiple of genuine interest over the initial click that brought a reader to the page. It’s low-quality “engagement”—the Internet equivalent of flipping through channels. Sites can even buy bots to “click” and artificially inflate their page-view count. This kind of fraud has become a serious concern for marketers and the advertising industry, who have begun to prefer assurances that ads are actually being seen by real human beings be it on mobile or the web. At first glance you’d think the solution is simply to switch to viewability as the measure of an ad’s performance. If it is seen, then the advertiser should (and would be comfortable to) pay for the impression. If not, then why burden the advertiser with that cost? The purpose of this document is to aid publishers in their endeavors to increase the viewability of the Display and Video (excludes Mobile, Native/In-stream) ads on their site, thus improving the value of those ads for advertisers, marketers, and the user experience. It is intended to be ad-server and content management system agnostic. It is also intended to include ad tech improvements, site changes, and business model changes that can be undertaken. 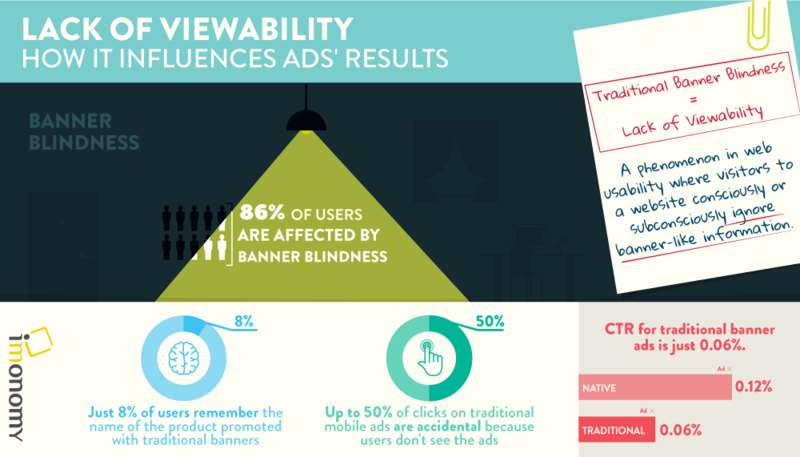 It is important to note that viewability is not about ad effect nor ad engagement. It is simply the delivery of ads that render on the screen, thus providing the Opportunity To See (OTS). While efforts such as these to better define “viewability” and understand its tangible value as a metric are progressing, the responsibility for optimizing ad placements still falls to publishers. There is certainly much that publishers can do to improve their ad placement choices. One choice that stands out as an effective way to address the viewability challenge is an ad product like in-image advertising. The reason is fairly obvious: articles with images receive 94% more attention than those that don’t. Prominent images attract readers’ attention and ads placed on those images are more engaging and likely to convert. If viewability is measured by “Opportunity To See”, as the IAB suggests, ad technologies such as in-image advertising’s innovative solution offer superior viewability and very appealing conversion rates. In order to be most effective, publishers should address all four of these elements and the iab makes several recommendations in its Viewability Primer to help publishers achieve this. Perform an in-depth analysis of the baseline data—how different ad units are performing across sites. The output from this analysis is a set of recommendations on ad placements by site and page-type, as well as the generation of a hypotheses for experiments that have potential for improved viewability. The iab recommends working close with UX design teams to experiment with site design optimizations in order to formulate recommendations for the design and publisher teams. They also recommend formulating a clear “vCPM” pricing strategy to drive viewability improvements. Sinead McIntyre highlighted some of them in her recent article titled “Optimize Ad Placements for Higher Viewability”. It is only possible to accurately measure viewability once your site has fully rendered. In addition, latency is a critical factor for improving viewability because ad render times have a direct impact on how viewable an ad is. Gather and analyze latency metrics for your site and ad units, specifically data about ad rendering time, 3rd party and site elements’ performance data. Use insights from your Site Re-Design process (described above) to inform your overall assessment of latency on your site and where you can most optimize site performance to reduce latency. Insights from your Site Re-Design and Latency testing and optimization phases will help inform your next step: evolving your Ad-Tech strategy and related changes to your policies and processes. This part of the process includes rules for determining the viewability of below the fold ads (with several interesting suggestions from the iab) and closely examining ad delivery mechanisms. We also recommend using insights from your earlier processes to carefully assess your choice of ad products and ad placements. In addition to the overall ad-tech strategy and processes, your choice of ad products for your site is clearly a critical factor too. You may well find that next generation ad products such as in-image advertising technology will yield better CTRs and, consequently, additional revenue relative to more traditional ad products in use on your site. One element that the iab Primer doesn’t deal with is one of the most important: creating engaging content. Without engaging content to attract your readers, your other optimizations will have limited results. Sinead analyzed the emotional triggers of engaging content in her blog past titled 5 Ways To Create More Engaging Content so be sure to read that piece too. Publishers have a variety of advertising products to choose from and results may vary in practice. What a growing number of publishers looking to optimize their site monetization are discovery is that next generation advertising products such as in-image ad products offer an effective way to overcome viewability challenges and increase engagement, while generating incremental revenue in an increasingly challenging market.